Wandering Threads: [ FABULOUS FINDS ] Hand Painted Ethnic Home Decor from Fabulloso! [ FABULOUS FINDS ] Hand Painted Ethnic Home Decor from Fabulloso! If you've been following Wandering Threads on Twitter or Facebook, you've probably already read me rave about Delhi based digital bazaar, Fabulloso. With a self-proclaimed selection of beautiful, whimsical, witty and quirky designer products, ranging from clothing, shoes and accessories to home decor and furniture, you're at risk of getting well and truly lost as your eyes wander this digital market space. 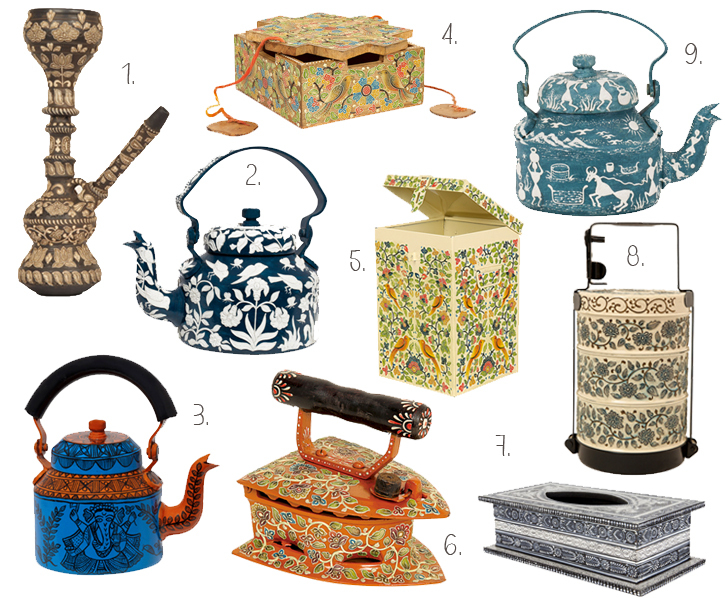 I, for one, am head over heels with those ornately pretty, hand-painted teapots and totally obsessed with that beautifully unique antique Iron (swoon!). And as I'm currently in the process of flat hunting, I can't think of a better way to envision my future living space than with Indian inspired, patterned home decor resting on my virtual shelves. Which ones your favourite? Thinking that pottery hookah looks familiar? Probably because it is. I also featured it here. Great blog and inspiring posts. I would love for you to visit My Dream Canvas. It would be great to connect with you.